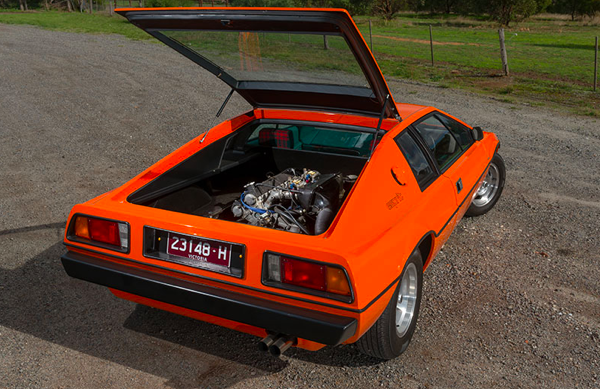 This immaculate Series I Esprit was bought in the UK a few years back by Carl Lakis (whose Lamborghini Countach LP5000S we also drove a few issues back) and it is a great example of a pivotal car for Lotus. 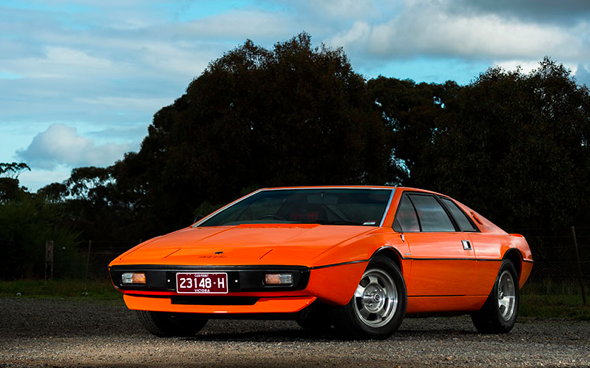 The Esprit’s bold shape was designed by Bertone stylist Giorgetto Giugiaro. 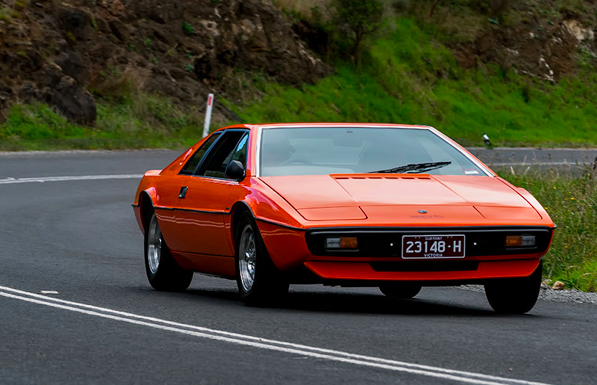 The Italian styling house was also responsible for the first Countach, the LP400, which debuted two years before the Esprit, and the Lotus has more than passing resemblance, particularly in the nose. I love the look of this car and it is so legit. With wild orange paint, a spectacular green interior with red tartan trim and orange shag-pile carpet it’s so 70s. It’s more Austin Powers than James Bond and made me want to go out and buy a pair of flared trousers and a paisley Gloweave body shirt! The seating position looks very reclined but is actually very comfortable and with the steering wheel and gear shift in the right spots the driving position is really nice. The pod-style wraparound dash with Veglia gauges is pretty cool too. Obviously a lot of thought was put into the ergonomics by people who knew about driving, which you’d expect because in the 70s Lotus was at the forefront of Formula One and up there with Ferrari. How many cars have a badge that reads World Champion Car Constructors 1963, 1965, 1968, 1970, 1972, 1973? The design is terrific and if it had have been built in Germany it would have been a world beater. It even features on a set of British stamps..
Lotus has always been renowned for its suspension tuning and its engineers have done suspension for the Lotus Cortina, Vauxhall Lotus Carlton, Corvette ZR-1 and original Aston Martin V12 Vanquish to name a few. This car is very easy to drive, it rides beautifully and nothing rattled, it’s very tight. The unassisted rack and pinion steering is lighter than a Porsche of the same period and you flex your wrists and it turns. It’s nimble and changes direction quickly like most mid-engined cars.